An armed Russian jet came within five feet of a U.S. reconnaissance plane over the Baltic Sea, CBS News national security correspondent David Martin reports. A U.S. official said Tuesday that the Russian aircraft came within five feet of a wing tip for a U.S. RC-135 reconnaissance plane. 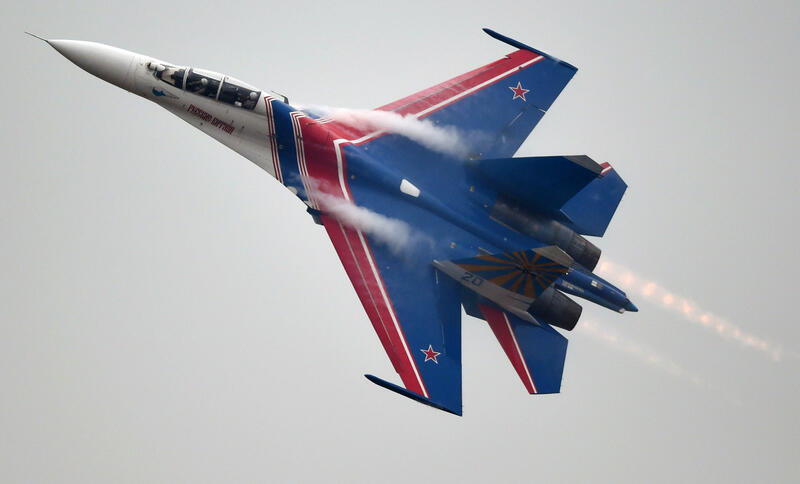 The Russian jet then passed under the U.S. aircraft and came up near the other wing tip. The U.S. Air Force considers the incident to be an unsafe intercept, Martin reports. The Russian Defense Ministry said that a U.S. RC-135 plane swerved dangerously near a Russian SU-27 fighter jet over the Baltic, state-owned RIA Novosti news agency reports, according to the Reuters news agency. U.S. Navy Capt. Jeff Davis, a Pentagon spokesman, said the American plane "did nothing to provoke this behavior," Reuters reports. The incident took place 25 miles northwest of the Russian enclave of Kaliningrad, which is located between Lithuania and Poland in northern Europe. The RC-135 reconnaissance plane compares in size to a commercial aircraft and is used to collect all electronic transmissions from a particular area. The incident comes amid rising tensions between the U.S. and Russia after the U.S. downed a Syrian jet on Sunday. Washington and Moscow are backing different sides in Syria's civil war, which has dragged on for more than six years. The U.S. coalition said a Syrian regime SU-22 fighter jet dropped bombs close to U.S.-backed forces on the ground southwest of Raqqa, the de facto capital for the Islamic State of Iraq and Syria (ISIS), CBS News correspondent Holly Williams reports. The U.S.-backed forces are fighting against ISIS, and they are supported by U.S. troops. The bombs were so close the U.S. sent an F-18 to shoot down the Syrian jet - the first time that's happened during the Syrian civil war. Russia, which backs the Syrian regime, retaliated by saying that it will track all U.S. coalition aircraft as targets. Russia also said it would shut down cooperation to prevent midair collisions, though U.S. Gen. Joseph Dunford, the chairman of the Joint Chiefs of Staff, said on Monday that the two countries were still communicating, and he warned against hyperbole. Last month, a Russian fighter jet flew within 20 feet of an American spy plane over the Black Sea, but the U.S. Navy called it a safe encounter. The Russian jet intercepted the U.S. Navy P-8A Poseidon aircraft in international airspace as it flew a course toward Russian territory, according to Russia's military.